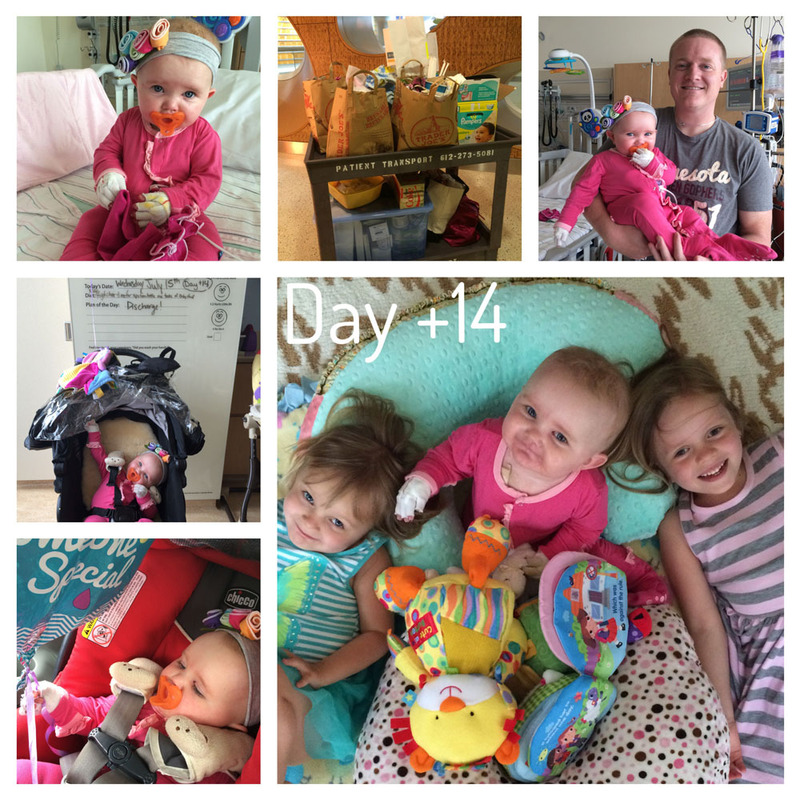 Day +14: We are home! We left the hospital around 3 pm through a row of doctors and nurses with silly glasses who sang us a goodbye song. I wish I had videoed it! We walked out with a cart full of stuff we accumulated, a bag full of medicines, and one sleepy girl who was overwhelmed with being home. Thankfully all of her meds are through the gtube so we don’t have to mess with the IV. A nurse came tonight to show us how to use a Joey pump, which will do Kiira’s continuous feeds. While we waited, I tried giving her a bottle, but it almost looked painful for her to swallow. I gave her a little food too, but we know this will all take time. Kiira’s sisters were overjoyed to have us all back. They wanted to give Kiira a bunch of toys, sing and talk to her. Kiira was so happy! For awhile we will be returning to the hospital daily for clinic. They’ll draw daily labs and examine her. They told us to expect to get re-admitted to the hospital at some point, since it’s bound to happen. For now, we’ll be adjusting to our new norm, administering about 10 meds 3x/day (which actually isn’t much compared to some post-transplant), waking up every hours to refill her good pump, and trying our best to keep her fever-free so we can stay home. 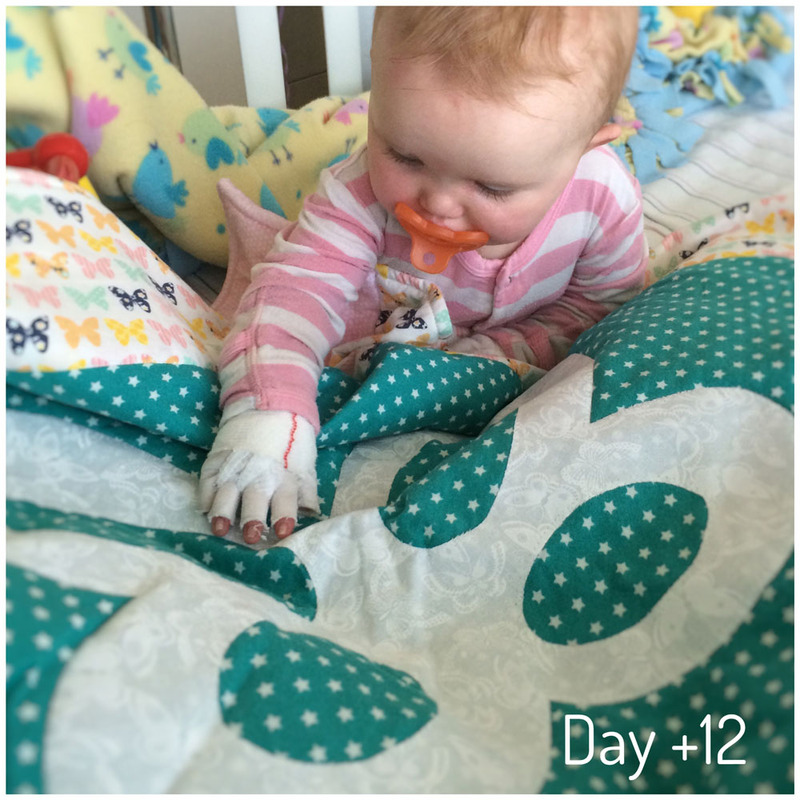 Day +13: The GCSF did its job and boosted Kiira’s white blood cells. It’s kind of a false boost, since her body can’t maintain it on her own, but she’ll get there eventually. She still has her rash and we think it might be from her anti-fungal meds, so we’re experimenting with Benadryl before she gets it. 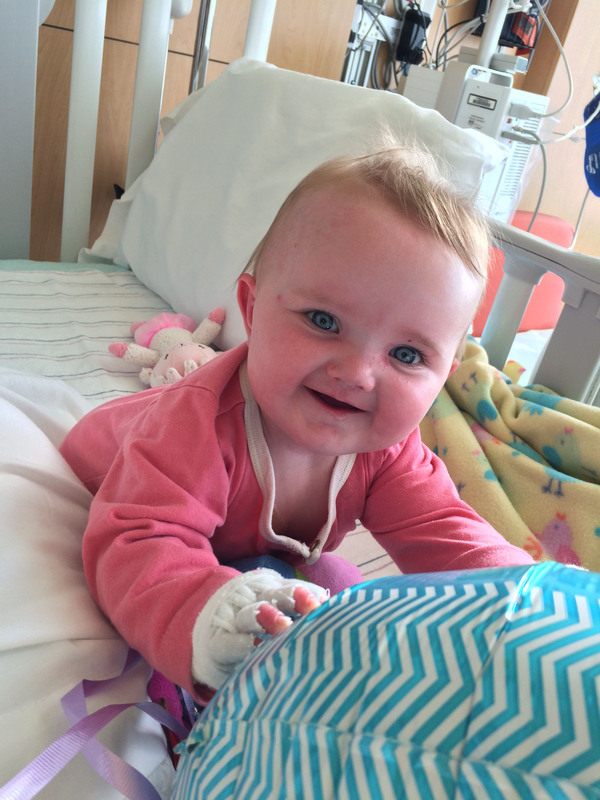 She is also getting some viral tests done to rule out a virus. I think they’re kicking us out tomorrow so today Kiira wore a mask as I pulled her in a wagon around the halls. She loved being out of the room and giggled as I showed her pictures on the wall. It made me excited to bring her home, as the therapy of being outside and with her sisters will probably be better than anything else. Kiira also saw a speech therapist just to make sure she is on track with words, swallowing, and eating, and she reassured us that her tongue is not fused to the floor of her mouth and even her gums may not be attached to her lips like I thought (or not as severely as I thought). Praise God! EB is severe in so many ways, but I think the fusing of all the body parts scares me the most for some reason. Anyway, she is on track and I fed her food for the first time in over 3 weeks. She loved it and kept it down. 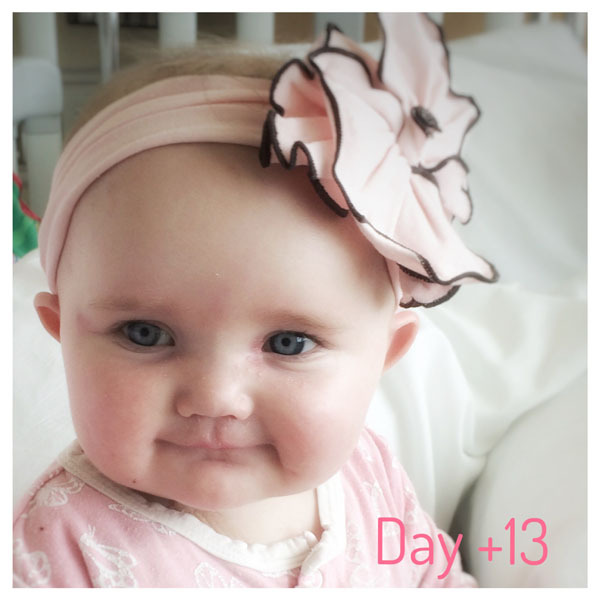 Her hair is really thin now, so I put one of her new headbands on (thank you to the person who sent them!) and I know I’m biased, but I think she looked so cute! Pa went home today and the girls are sad that we don’t have another visitor coming tomorrow, but at least Kiira should be home. Please pray we can keep Kiira healthy and her sisters will respect the boundaries we put in place and Kiira’s cells will grow and repair her skin! 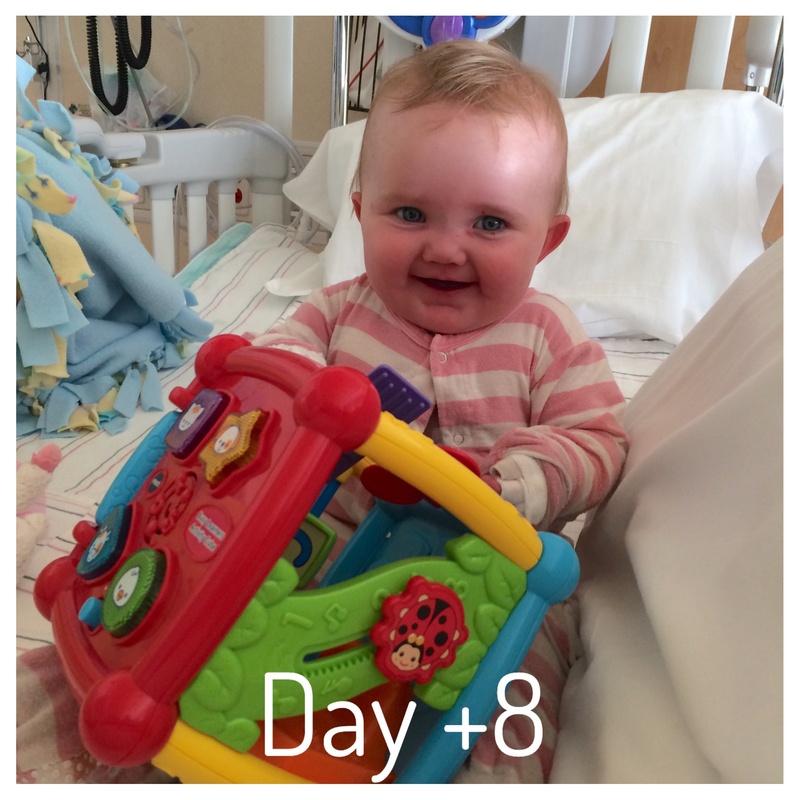 Day +12: Kiira’s numbers are continuing to fall, so they gave her GCSF, a glycoprotein that stimulates the bone marrow to make white blood cells. Patients old enough to explain, say it can cause bone pain. In some ways I’m glad Kiira is too young to understand and express feelings. She just seemed sleepy today, which is understandable after a nap-less day yesterday and a disrupted sleep through the night. 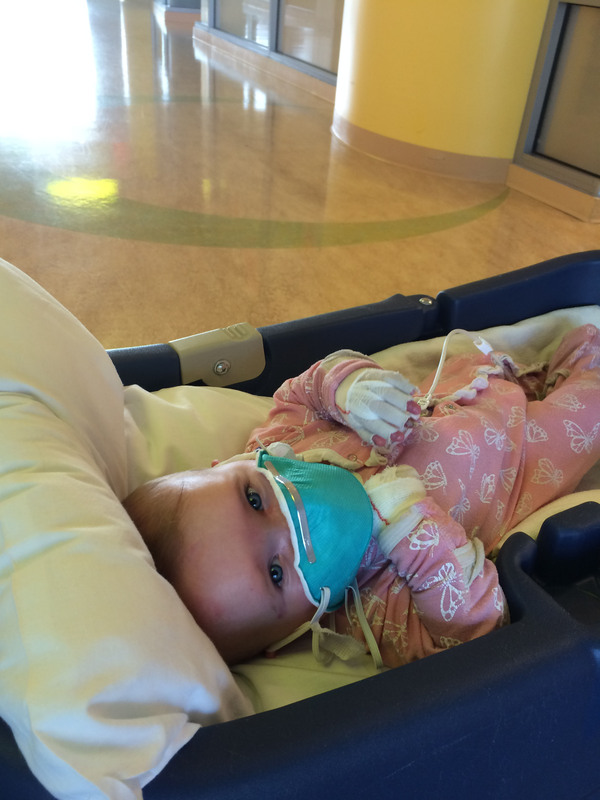 The doctors expect we can go home in 2-3 days unless her numbers go to 0 or she gets a fever. She also has a bit of a rashy face that we’ll keep an eye on. She has received a few gifts lately, including a Noah’s Ark toy and this beautiful butterfly quilt. Thank you to those who are thinking of us and keeping us in your prayers. I know God is capable of healing Kiira–I just pray He is willing. Unfortunately in the last day, 2 people in the EB community have passed away. Please keep their families in your prayers too. 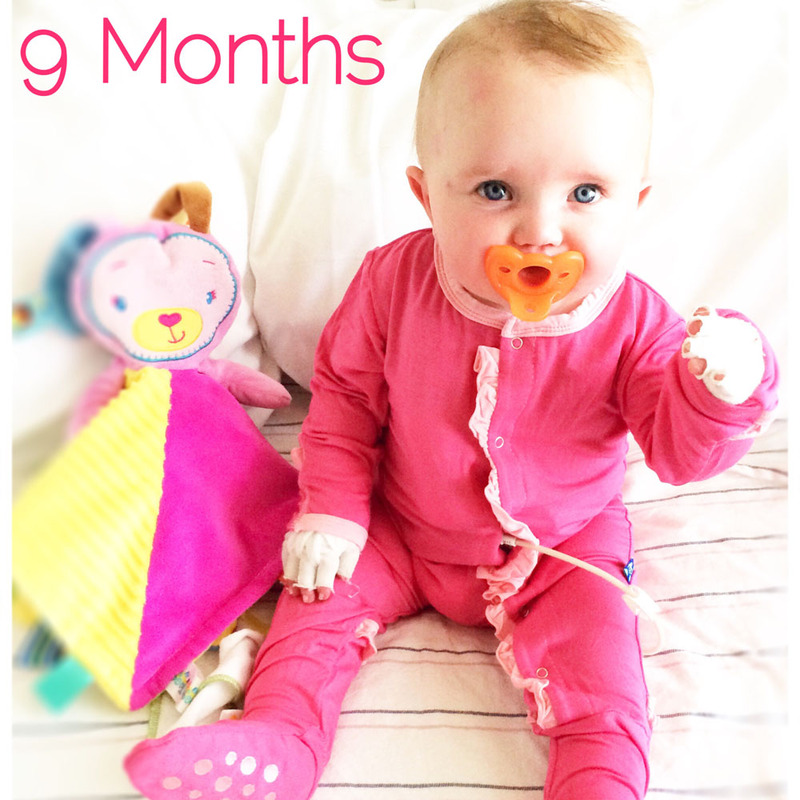 Today Kiira is 9 months old! Not only has she been out in this world longer than in my tummy, but she has been through more in the past 9 months than I have in my life. 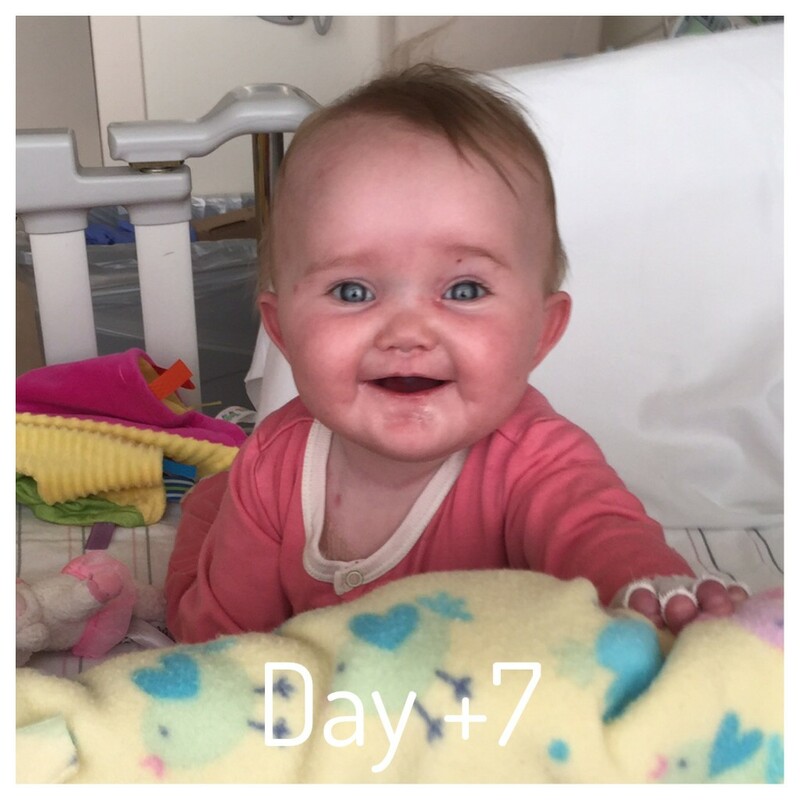 She is about 17 lbs, still on the verge of crawling, pulls up on her knees, babbles (even Ma comes out now and then), sometimes waves hi, and she is building her second immune system. She is a busy girl! Today is also day +11 and Kiira is doing well. They moved most of her medicines from IV to her gtube so that by the time we bring her home, we shouldn’t need any IV meds. She is still keeping down her feeds and will likely be on a continuous feed at home, but they’re trying to kick us out of here soon! It’s kind of scary since the nurses keep such a close watch on Kiira and her meds, but it will be nice to have the family back together again. We should know more tomorrow. Day +10: This morning I lifted Kiira up from her blanket and there was hair all over it. I knew it was going to happen, and she is doing great, but for some reason, losing hair is symbolic, and I’m sure all who have gone through chemo can relate. I’m not going to shave my head–she is just a baby and doesn’t know and will be nearly even with my other girls at 9 months. But still, to lose that sweet, fine baby hair with the little curl… It just tugs at my heart a bit. 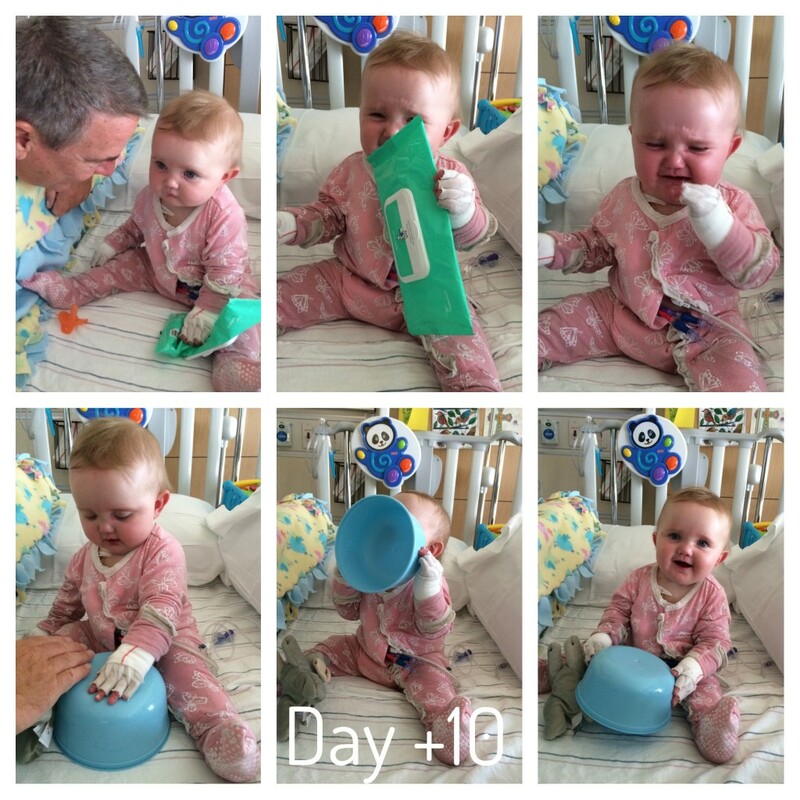 Kiira had a good day of playing, laughing, getting mad with that strong temper she has, and no fever or vomiting. As long as her fever stays away, we’ll get to bring her home (in Mn) soon! The rest of the family went to Lake Nakomis today and realized a triathlon was happening, so parking was horrible, and then tonight my dad took me to dinner downtown and there was a huge concert going on. I guess we aren’t very “in” on the city happenings. However, the food and company were great, and it was a much needed break from those 4 walls. Today’s bible verse was a good reminder for me, and I just have to say that I’m trying! “Rejoice always, pray without ceasing, give thanks in all circumstances;” 1 Thessalonians 5:16-18. 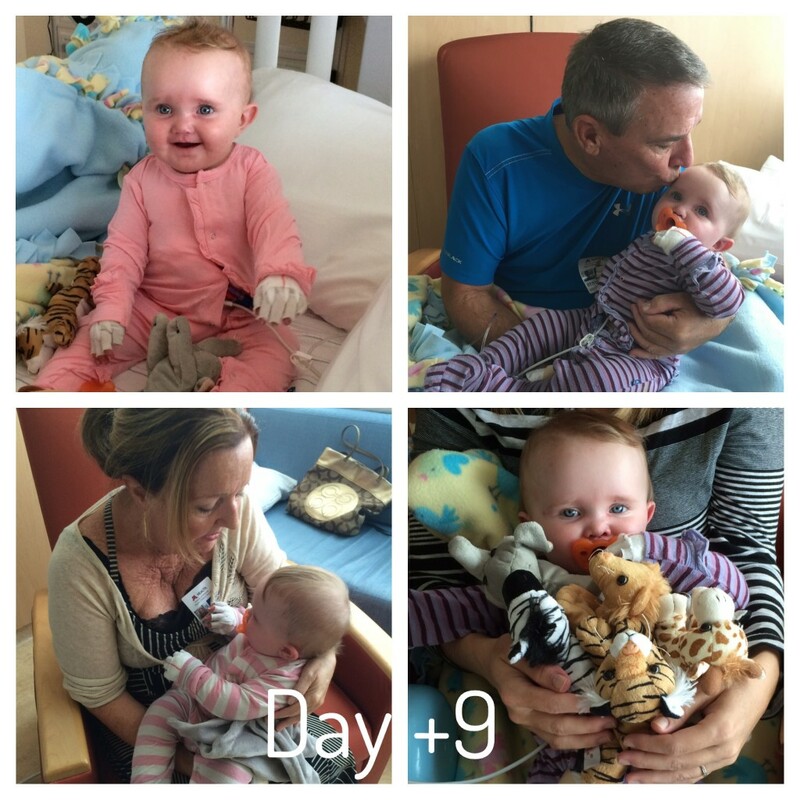 Day +9: Kiira continued to run a slight fever through the afternoon, but she was finally able to hold down all of her milk. This evening she even perked up and played happily until bedtime. We also noticed some hair falling out, and so it begins. I’m still not seeing any changes in her skin, but I know that will still take awhile. At least she is happy again! Today Aunt Kiki left and pa arrived. It’s nice to have familiar faces here and distractions for Kiira’s sisters. This week they went to the Mall of America and the Children’s Museum, which they loved. I look forward to us all being able to do activities again, but for now my focus is Kiira. Day +8: Our poor girl was not feeling so well today. She got sick numerous times, had a slight fever, and slept on and off throughout the day. I spent the day with Kiira’s sisters, so my husband told me they put her back on antibiotics and anti-nausea meds, did a culture to check for infection, and they stopped feeds for awhile. She is finally asleep and back on continuous feeds. Her numbers increased even more today, but I hope it’s not because she is fighting an infection! We should have culture results tomorrow. This picture was from early this morning, before she started feeling sick. Also, they rechecked her for CMV, and the level is so low, that they aren’t worried about my milk anymore. Praise God for both of those things! On the downside, Kiira got sick a few times today and is super puffy again. The swelling might be contributing to added blisters, or could be all the extra handling. I noticed her respirations were high tonight and her temp is 99.5–not concerning yet, but we’ll be keeping an eye on her. Her hemoglobin is still a little high, but the plus side is she has not needed any transfusions. She has also gained about 2lb in the last 3 weeks. We are moving up a size in diapers and some of her clothes. I don’t think we need to worry about malnutrition for this girl! Overall, we are doing well and continue to take it day by day! 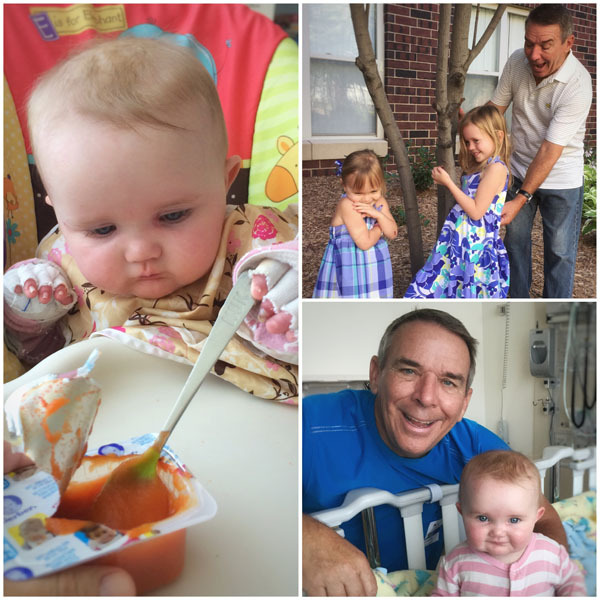 Also, I had you pray for Abigail–she is awake, alert and breathing on her own–a true miracle! She is still scheduled for her BMT in 15 days. So many RDEB/JEB families are now seeking out a BMT. I love that there’s hope for these kids! Day +6: Every day the doctors come in and say how great Kiira is doing and “The less you see and hear from us, the better” or “a boring day is a good day on the BMT floor”, and it’s true. 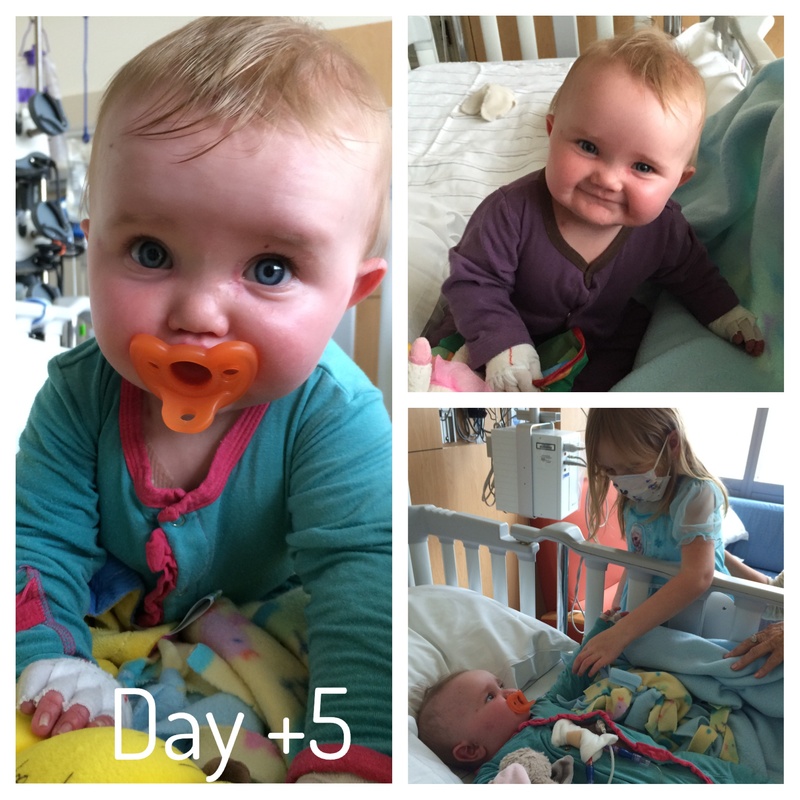 Kiira’s White Blood Cell (WBC) and Absolute Neutrophil Count (ANC) are going up–these are measures they use to tell us when we can go home from the hospital. They tend to go up and down and back up since this protocol has low chemo, and we don’t put a lot of weight in the numbers yet. Mucositis is likely to kick in about now, so we’ll be watching Kiira’s mouth closely, but we have another week or so before the hair loss. Kiira almost seems back to normal though, so that is comforting and I thank God for that. She even wanted to play her favorite “Whoa!” game today, where she falls back onto a pillow over and over again giggles. I love seeing her laugh! Day +5: Today was a good day for Kiira. She was fairly happy and got a visit from her sisters and aunt Kiki. We got the go-ahead to feed her from a bottle again so we may try that tomorrow. They’ve been steadily increasing her milk intake with no issues, but it looks like we’ll be switching to formula. Obviously I want what is best for Kiira and, though we may not go through the testing of my milk (due to insurance and the time it takes to get results), if my milk will make her sick, then it’s not what is best. In the scheme of things, I know it isn’t a big deal–I would be done in 3 months anyway, but I kind of feel like it’s yet another thing EB is robbing from me. I realize I keep thinking about what EB has taken from me and my family and it sounds so selfish, and probably entitled. I try to be thankful–I am incredibly grateful that Kiira is doing well so far and that despite dealing with all of this, our situation has also brought us so many prayers and amazing new faces, hope for Kiira, a showering of love and a perspective on life I’ve never had before–but some days it still is just hard.